Orwell Bowling Club - Orwell Bowling Club - Home page. Welcome to our website! To navigate through it, either use the menu options above or click on any hyperlink. Orwell Bowling Club is a small but friendly Lawn Bowls club in the town of Milnathort, Perth & Kinross, Scotland. The club currently has vacancies for new members; see Club Information and News for more details. The range of club competitions has expanded significantly over the years, with many trophies being donated in memory of past members; see Club Competitions for more details. The club was founded in 1890, and celebrated its 125 anniversary in 2015. The following archive article relates to the 1990 Centenary. 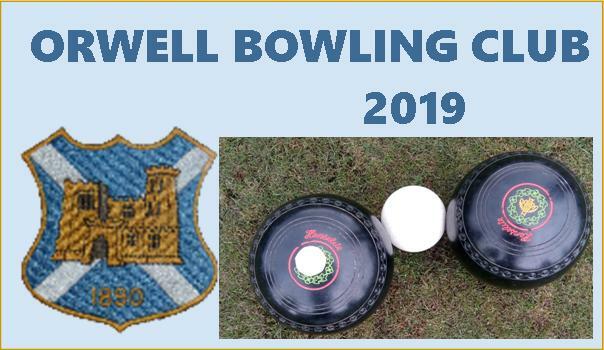 Orwell Bowling Club was founded in the year 1890 and took its name from the parish of Orwell and in its first year played on the bowling green situated between Backloan and Victoria Avenue in Milnathort. In 1931 it moved to its present location in Westerloan with the money for the move and new green being raised by holding whist drives and Fetes in the local area.Orwell has been associated with Clackmannan District since well before the Second World War and in those early years the players would travel to games by train on the Devon Valley line. The patrons of Orwell bowling club in its formative years were Rt. Hon. J B Balfour; Sir Charles Adam, Bart of Blairadam; John Paton Esq., Lethangie; George Younger, Valleyfield, Newmills; H J , Montgomery Hattonburn; patroness; Mrs Reid, Thomanin. From the early minutes one item is a letter to one of the patrons which states, "I am instructed by my committee to inform you that we had the privilege of taking a dozen or so carts of gravel out of your quarry on The Old Road in place of your subscription." The club agreed to donate 30/- to the Clackmannan County Association for a testimonial to Mr. John Reid who had been County Secretary for over 20 years and a levy of 6d was made on each member to pay for this donation. The first reference of a friendly away match appears in the club minutes for 13th July 1897, when Orwell played Tillicoultry. On the notice intimating the team it was also intimated that the 4:50pm fast train stopped at Tillicoultry on request. A major benefactor of the Orwell club in those early days was Mr D Hogg who was resident in Chicago but had strong Milnathort connections. Mr Hogg sent a cheque annually to be used for the benefit of The Club until 1932. On January 9th 1899, Mr Hogg visited Milnathort and entertained 29 members to a supper in the Thistle Hotel which is recorded as being, 'received with great enthusiasm. A most enjoyable evening was spent which landed before it was finished in The Bay of Biscay '--- perhaps some reader could translate the above to present day terms. See map for driving directions from Milnathort centre (turn right at end of Bowling Green Avenue into drive to Club car park). Pedestrian access also available off Wester Loan. Note: Postal address previously Wester Loan, Kinross, KY13 9YH.